USS Dallas (SSN-700) departs Souda Bay harbor with dry deck shelter attached in 2004. A dry deck shelter (DDS) is a removable module that can be attached to a submarine to allow divers easy exit and entrance while the boat is submerged. The host submarine must be specially modified to accommodate the DDS, with the appropriate mating hatch configuration, electrical connections, and piping for ventilation, divers' air, and draining water. The DDS can be used to deploy a SEAL Delivery Vehicle submersible, Navy divers, or Combat Rubber Raiding Craft (CRRC). A pair of rigid-hulled inflatable boats operate alongside USS Archerfish during a 1993 exercise. Archerfish has a dry deck shelter attached to its deck. The United States Navy's DDSs are 38 feet (12 m) long and 9 feet (2.7 m) high and wide, add about 30 tons to its host submarine's submerged displacement, can be transported by trucks or C-5 Galaxy airplanes, and require one to three days to install and test. They have three HY-80 steel sections within the outer glass-reinforced plastic (GRP) fairing: a spherical hyperbaric chamber at the forward end to treat injured divers; a smaller spherical transfer trunk; and a cylindrical hangar with elliptical ends. The hangar can support a SEAL Delivery Vehicle (SDV) submersible, six Navy SEALs to man the SDV, and a crew of Navy Divers to operate the DDS and launch the SDV; or 20 SEALs with four Combat Rubber Raiding Craft (CRRC). The SDV release team consists of 2 officers, 2 enlisted technicians, and 18 divers. The two SEAL delivery vehicle teams report to Naval Special Warfare Group 3. There are currently six portable dry deck shelters in use by the USN, the first one built by Electric Boat. The first, designated DDS-01S ("S" for starboard opening outer door), was completed in 1982. The remaining five, DDS-02P ("P" for port opening), -03P, -04S, -05S, and -06P, were built between 1987 and 1991 and were built by Newport News Shipbuilding. The shelters are maintained by a combined effort of Navy divers stationed on the teams and workers of the maintenance company Oceaneering International. They have expected useful lives of about 40 years each. The first submarine to have an operational dry deck shelter was the USS Cavalla, which was fitted with the DDS in 1982 and first deployed with it in 1983. Note: A total of 30 Virginia-class submarines are planned. Note: The Ohio-class SSGNs are capable of supporting dual dry deck shelters. Note: The Benjamin Franklin-class special operations attack submarines were capable of supporting dual dry deck shelters. Five Permit-class submarines were also fitted to carry the DDS. ^ Lillo, RS; Porter, WR; Caldwell, JM (2001). "Development of Oxygen Monitoring Capability for the Existing Hyperbaric Carbon Dioxide Analyzer Used in Dry Deck Shelter Operations". US Navy Experimental Diving Unit Technical Report. NEDU-TR-01-01. Retrieved 2013-03-20. ^ a b c d e Southard, Steve (February 1999). "Dry Deck Shelters—Deploying Special Operations Forces from Submarines". Federation of American Scientists. Retrieved 19 April 2014. ^ "Dr Lee Willett, The ''Astute''-Class Submarine, Capabilities and Challenges, RUSI (2004)" (PDF). Archived from the original (PDF) on 28 September 2011. Retrieved 7 November 2011. ^ Pike, John. "Dry Deck Shelter". GlobalSecurity.org. ^ Naval Special Warfare Command. "HQ and Components". ^ "Los Angeles-class Attack Submarine". U.S. Naval Institute. ^ Staff (2006-09-05). "Oceaneering Announces Dry Deck Shelter Planning Yard and Maintenance Contract". Oceaneering International. Archived from the original on 2014-01-02. Retrieved 2013-11-21. ^ Staff (2013-07-19). "Oceaneering to provide maintenance services for dry-deck shelter". strategicdefenceintelligence.com. Archived from the original on 2014-01-02. Retrieved 2013-11-21. ^ a b Klose, John (July 2003). "SDV Units in Great Demand as Speed, Range Improve". Seapower. Retrieved 5 September 2018. 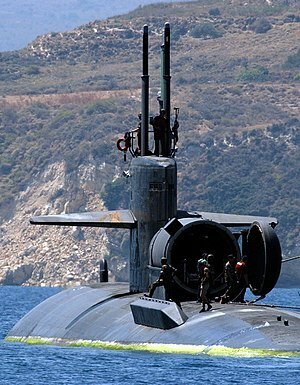 ^ "US Navy 21st Century - SSN Virginia Class". Jeffhead.com. Retrieved 2013-02-25. ^ Polmar, Norman; Moore, K. J. (2003-11-30). Cold War Submarines: The Design and Construction of U.S. and Soviet Submarines, 1945-2001 (Kindle ed.). Potomac Books Inc. p. 263. ISBN 1-57488-530-8. ^ "Seawolf-class nuclear-powered attack submarine". Archived from the original on 19 April 2014. Retrieved 19 April 2014. ^ a b "SSGN, A Transformational Force for the U.S. Navy". Archived from the original on 26 November 2015. Retrieved 19 April 2014. ^ a b Pike, John (2 January 2000). "Dry Deck Shelter". Military Analysis Network. Federation of American Scientists. Retrieved 5 September 2018. ^ Gardiner, Robert; Chumbley, Stephen, eds. (1995). Conway's All The World's Fighting Ships 1947-1995. Annapolis, MD: Naval Institute Press. p. 612. ISBN 1-55750-132-7. This page was last edited on 22 September 2018, at 05:14 (UTC).